Thanks for reading the entire run of Post Apocalyptic Nick. We had a great time doing it. Don’t worry, we’ve already got the next strip with Tom in the works and it will be debuting soon. In the meantime, the big news is, we have a Kickstarter for Post Apocalyptic Nick: End of the World Edition! It’s going to be a 60-page book with all kinds of extras, including some extra strips. 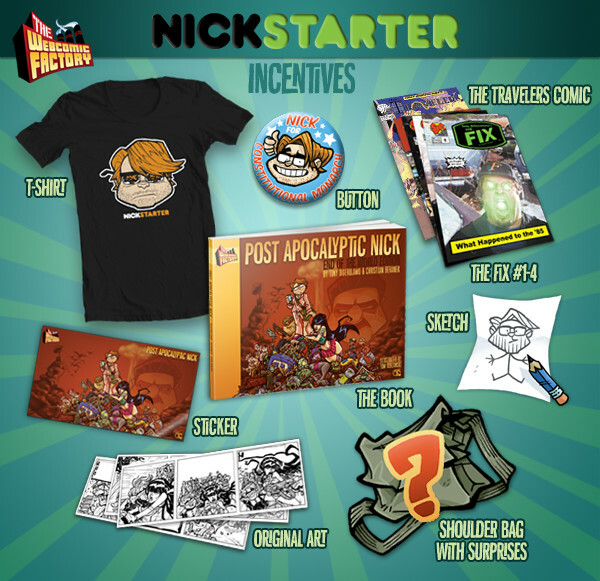 Plus, we’re going to be offering all sorts of Nick-clusive merch for your Kickstarter—- Well, Nickstarter donations. Here’s a sneak peek!